Historical buildings are national symbols and treasures, so you must use extreme caution when trying to restore or repair them to preserve their appearances and structural integrity. This can be tricky when you need a scaffolding system that lets you work on a building in the least invasive way possible, but Scaffold Resource is always up to the task. Learn a little bit about our role in restoring the Supreme Court Building by reading ahead. The Supreme Court represents an entire branch of our system of government, and its building is an important part of our history and culture as Americans. To restore the building while still respecting its original appearance, we had to create a scaffold access system that was not at all mechanically tied to the structure itself. Nonetheless, our scaffolding systems provided access to every surface necessary so that the building’s integrity could be protected during restoration. 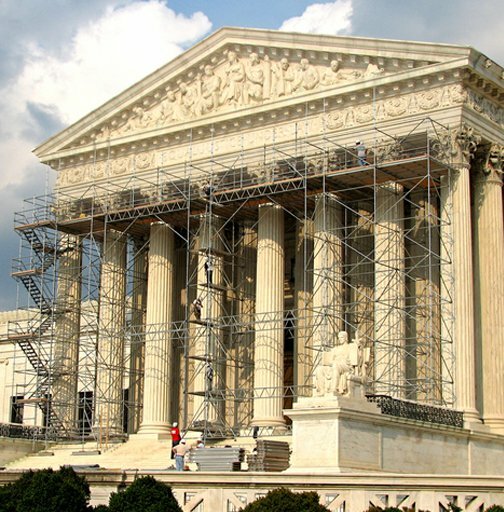 Based on our work on the Supreme Court Building, you can tell that the team at Scaffold Resource can be trusted with the most delicate tasks. If you’re in need of scaffolding rental serving Washington, D.C. or you need another kind of work platform, call us at (301) 924-7223. Scaffolding safety is essential, and it starts before you even make your way to the top of the work platform. Even the way you access your scaffold can impact your safety, the safety of others, and the job at hand. Watch this video for safe scaffold accessing techniques. Never take shortcuts to get to the top of your scaffolding faster. Use designated access points such as walkways, ladders, and stairway towers, and always keep three points of contact while climbing. This means having both hands and one foot or both feet and one hand contacting the ladder or access path at all times. Use a pulley system to bring your tools up, but always do this with a partner. Remember to use your work platform carefully , and contact Scaffold Resource if you need scaffolding rental serving Washington, D.C. Call our offices at (301) 924-7223 or peruse our website today. Emergencies can happen anytime, anywhere, and they rarely come with any warning. If you’re up on a scaffold when an emergency strikes, it’s important that you know how to get yourself to safety as quickly as possible. Continue reading for help managing fire and medical emergency safety on a job site with scaffolding. There’s nothing more important than personal safety, and that rule applies no matter where you are or what you’re doing. 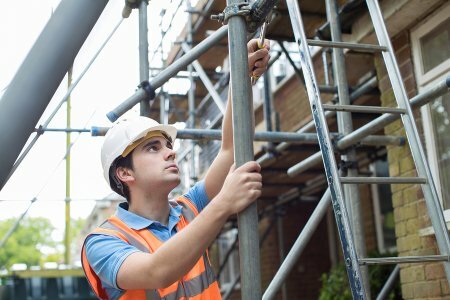 Whether you’re a seasoned veteran or it’s your first time working on scaffolding, you need to know what to do and what not to do before climbing aboard. The first step in the process should always be to walk around your scaffolding system and make sure that every component is safe and sturdy. If you climb up without checking your scaffolding and run into a fire or a medical emergency, you might have another emergency to deal with that you didn’t even realize. When climbing a ladder of any kind, you should always keep three points of contact. This could be both of your hands and one foot or both of your feet and one hand, as long as three of your limbs are making contact with the structure you’re climbing. This is a standard you should never let go of if you use scaffolding. You might fall if you don’t keep three points of contact, or you might drop a tool and hit one of your coworkers. Accidents are unplanned by definition, but you can plan on what to do in case one does occur. If you’re up on scaffolding and encounter a fire or medical emergency, you should have a protocol to follow that will get you to safety. If you’re going to use scaffolding serving Washington, D.C., you need to know how to use it right. Once you know how to stay safe when on your work platform, call Scaffold Resource at (301) 924-7223 or look around our website to see what we can offer.